Realize, recognize, respond: these three words take on a deeper meaning for me and the many other members of the Tri-State Coalition Against Human Trafficking and Slavery during January—National Human Trafficking Awareness Month. 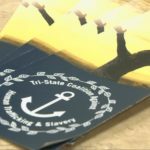 The Tri-State Coalition is a collaborative, faith-based network that engages in education and advocacy in an effort to eradicate human trafficking in Dubuque, Iowa, and the surrounding area. The Coalition is comprised of members from local religious communities (including the BVM Sisters) and community leaders who collaborate with other area groups to spread awareness of this modern day slavery. Many Tri-State Coalition members like myself know how to identify and respond to human trafficking. 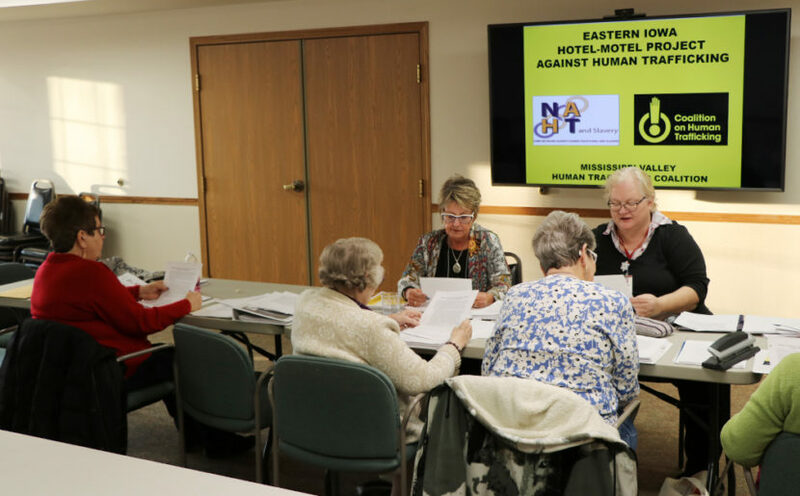 A number of us have received training designed by the Coalition on Human Trafficking (COHT) in Omaha, Neb., that addresses trafficking concerns specific to the hospitality industry. The COHT model uses the words realize, recognize, and respond as the basis for their training initiatives. Its premise is that individuals need first to realize that human trafficking is happening. Then they need to be taught to recognize the signs of human trafficking and to respond in ways that are safe and appropriate to each situation. Using this model, I and other Tri-State Coalition members are offering to train area hotel and motel staff to realize, recognize, and respond when they feel a guest or employee is being trafficked or at risk. Recently, I helped train all of the more than 200 hotel staff members at the Grand Harbor Resort in Dubuque using this curriculum. For some, being reminded of their personal traumas created a few emotional outbursts or silent tears. So what can you do in your area? You may believe that human trafficking is something that happens in that mythic land called “Elsewhere,” but trafficking is documented in every state and territory in the U.S. Between 2007 and 2017, the National Human Trafficking Hotline reported more than 40,000 trafficking cases. Anyone could be a target. Potential trafficking victims are unaware of their vulnerability to being trafficked or to, unintentionally, becoming traffickers themselves. They may stand on that precarious line of unemployment, underemployment, or personal debt. Others have experienced deprivation, degradation, or disillusionment that makes even the affluent targets for traffickers. How do you recognize when trafficking is happening? Listen to your instincts when a situation seems risky, inappropriate, fear-causing, or suspect. Be observant of the happenings around you. Stay engaged with the people around you rather than the cell phone in your hand. When you accept that human trafficking happens in your own backyard, you begin to recognize the visual clues. Is unable to leave their worksite or home without boss’ permission. Even those without extensive training can sense when something seems unusual. Observe and report are your safest actions. Knowing how to respond to a suspected trafficking situation is foundational to the safety of both the witness and the potentially trafficked person. Don’t try to be a hero. Unless you are trained to deal with potentially dangerous situations, it is wisest to withdraw from jeopardy and call the authorities. 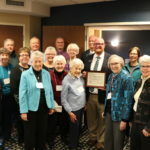 When I was considering becoming a BVM associate, Mary Jean Ferry, BVM, taught me that BVM Foundress Mary Frances Clarke would advise people to “do the loving thing.” I hold on to those words when I am dealing with the pain and strife of fighting for human trafficking victims and survivors. What is the “loving thing” you are willing to do to support human trafficking victims? Call 1-888-373-7888 or 911 to report any human trafficking concerns you may have. Featured image: At Mount Carmel, in Dubuque, Iowa, Associate Suzie Wright teaches other Tri-State Coalition Against Human Trafficking and Slavery members COHT’s realize, recognize, and respond model. Dubuque area Catholic sisters announce a campaign to train hotel employees how to identify and respond to human trafficking in their workplace. A new campaign in Dubuque is looking to educate hotel employees about the signs of human trafficking.